Take 2 parents and 10 kids, put them in a 40-foot bus, and send them on the road for 3 years playing their music. What do you get? 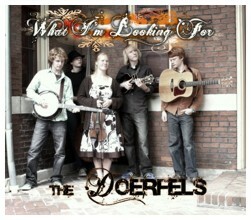 The Doerfels, an amazing 12 member family bluegrass band, whove wowed audiences and impressed critics from Branson, MO up and down the East Coast, to Canada. What makes them remarkable is their average age is 15 years old! 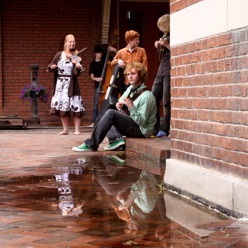 . The core band consists of the oldest son and leader TJ, 20, on banjo; Kim, 18, on the fiddle; Eddy, 16, on mandolin; Joey, 14, on bass and cello; and Ben, 13, on guitar. The whole family joins in on certain songs and adds humor to the act, making it entertaining for all ages. If you like country, gospel, and bluegrass, interspersed with a touch of blues, jazz, swing, and classical, youll want to catch this outstanding, young talented band! See why The Doerfel Family is a force to be reckoned with.* No strings attached! *-- Steve Baldridge, Goldwing Express, Branson, MO.